Phase-Changer converters are manufactured to the highest standards and utilize a unique microprocessor based controller to provide quality 3 phase output from your single phase utility supply. Make sure that your Phase Changer is not installed outside in the weather and is shaded from direct sun, which can increase internal temperature dramatically and lead to component failures or shortened operating life. While your converter does provide a true 3 phase output, there are a few 'tricks' that you must understand before you connect your Phase-Changer power converter. Therefore it is most important that you read the following installation information BEFORE powering up your equipment. Output of standard converters differs from 3 phase utility in that only the L3 phase is 240V when measured to Neutral or Earth. L1 and L2 are generated by the converter, while L3 is actually connected directly to the incoming supply. Converters are primarily designed for 3 phase loads and phase to phase voltages reflect this. During start-up of the 'Phase Changer' converter or any connected motor or machine, supply currents may rise to 500% of the maximum nominal input currents shown on the motor nameplate, depending on the mechanical load being started. The converter should be installed as close to the switchboard as possible. This will reduce voltage drop when the converter or an external motor starts. Install a motor rated circuit breaker (D curve) in the supply switchboard. For small convertrs, install an industrial single-phase three pin wall switch-socket combination. Larger converters must be conneced directly to the Switchboard by a dedicated circuit breaker. The neutral wire must be connected (even on 480V installations). Output: All Phase Change Converters are fitted with a 3 phase distribution board with input circuit breaker and either an output circuit breaker or RCD (safety switch - whenever an 3 phase outlet is factory fitted). Machines or 3 phase outlets would be connected to the Phase Changers distribution board. Some users install additional 3 pahse distribution boards in their premises when multiple machines need to be operated from the one converter. All hard wired converters are fitted with correctly sized input and output 'D' curve circuit breakers for convenience and protection. In these cases you will need to supply and connect suitable cable between the converter, the supply and the load. You must still provide overcurrent protection device at your switchboard supply point. It is most important that this cable size is generous and not under-sized. Each machine connected to a converter needs to be checked and if necessary slightly modified to work with the output of a converter. A competent electrician is recommended. 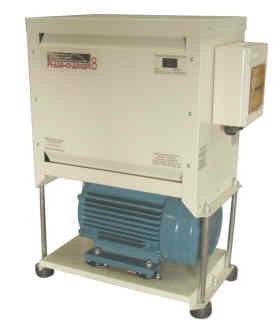 For machines WITHOUT a neutral connection: All control circuits and 415V single phase loads MUST be between the L1 and L3 legs, including internal step down transformers. You can reference to earth to measure voltages in control circuits. If you measure 360V anywhere, you know you are connected to the L2 phase, and some wiring changes are needed. For machines WITH a neutral connection: The Neutral is being used to power a single phase load somewhere on your machine. It may be the control circuit, lighting, small motor, digital controller or display. It is CRITICAL that whatever the single phase load is, it must only be connected to the L3 phase of the converter. In addition, any 415V single phase loads must be between the L1 and L3 legs. This option creates a new neutral point between the output phases of the converter, so approx. 240V is present between the new output neutral and each phase. However, there are limitations as neutral current is limited to approx. 2 amps (3 amps optional) and is only there for running smaller 240V loads like control circuitry, solenoids etc. If the machine being connected has a requirement for larger neutral currents, for example a heating bank, the machine should be connected to the incoming supply neutral, and follow the guidelines as shown for a standard converter. Special Note on Phase Changer 2 and Phase Changer 3 models (from May 2014). PC2 and PC3 converters have are designed as plug-and-play and have a centered neutral output as standard, so all phase to neutral voltages will be approximately 240V. Note that Neutral output current should be limited on these models to 1amp only. If more is required, please consult Phase Change Converters. Other installation guidelines still apply as detailed above. The internal control circuit will be designed to operate off two of the three phases, or 415V (Australia). This will either be via a 415V control transformer or by contactors and relays that have 415V coils fitted. In any case it is critical that the control circuit is powered from the L1 / Red and L3 / Blue phases only. To check this one method is to simply trace out the wires. Alternatively, connect the supply to and from the converter so the control circuit of your machine is powered up, but do not attempt to start the machine itself. Using a multimeter on the ACV range, measure each of the 2 legs of the control voltage to earth. For example, across the control transformer input, one leg should read 160V (being L1) to earth and the other should read 240V (being L3) to earth. Between the 2 phases there will be 415V (or possibly up to 5% more, due to an unloaded condition). Suggestion 1; swap the control circuit supply wire in the control panel to the correct phase. Suggestion 2; rotate phases on the machines supply plug or connection box to establish the correct voltages on the control circuit. Use multimeter voltage check to confirm. Test the machine; Once all of the above is OK, quickly pulse the motor on and off to check direction. If correct the installation is now complete. If the motor direction needs changing, swap supply phases L1 / Red and L3 / Blue ONLY. This will reverse the motor direction, while keeping the control circuit phase connections still correct. Swapping phases at the machines supply will change the direction of all motors or individual motors can be changed at their control contactor or overload. All 3 phase machines that also require a neutral connection, have one thing in common - there is 240V load(s) associated with that machine. It may be a control circuit, lighting, heating element, smaller single phase motor, solenoid etc. What you must do is determine that the single phase load(s) are and ensure that the active associated with that load is supplied by L3 / Blue wire from the converter. As explained previously, this is the only phase that has a 240V reference to neutral (& earth). If the wrong phase is connected, the supply voltage to the single phase load(s) will be low (approx 170V for L1) or high (approx 360V for L2). The machine will probably not function correctly and in extreme cases damage may occur to either the machine or to the converter. 1. Apply power to the machine, but leave the main switch or circuit breaker on the machine turned off. 3. Once you know the phase connections coming in, switch off the converter and trace the machines wires to ensure any 240V loads are connected between L3 / Blue phase and Neutral ONLY. Test the Machine: Once all the above is OK, pulse the motor(s) on your machinery on and off to determine motor direction. If correct, installation is complete. If the motor direction needs changing, swap L1 / red phase and L2 / white phase ONLY. This will change the motor(s) direction, while still keeping the control circuit and other single phase loads on the correct L3 phase. Swapping L1 & L2 at the machine supply will change the direction of all motors, while individual motors can be changed at the associated motor contactor or overload. The most common single phase 240V load on a machine is a control transformer, however it is possible (in very few cases) to have a 415V control circuit while still having other single phase 240V loads on the machine. In this situation, you will need to take extra special care, when checking out the machine connections. A competent controls electrician is highly recommended. Provided the correct sized converter is selected, most 3 phase welders work extremely when powered by a Phase-Changer. All Phase-Changer converters are fitted standard with a 'hard start feature' which will provide a significant power boost for short periods in high load conditions. This is ideal for most machine applications, but not necessarily desirable while welding. As welder sizes, operating currents and welding applications vary dramatically, it is very difficult to set the correct level for the 'hard start' feature to cut in during welding applications. A 'hard start' event will be evident by a solid pulsing of the converter. If this is happening a lot while welding, you may well be welding at high currents nearer the limit of the converters output capability. In very few cases and as an added feature in the Phase- Changer, the hard start feature may be desensitised by removing a link LK1 on the top board of the microprocessor controller. As an option we can fit a selector switch to the outside of the converter for multiple applications where the two levels of sensitivity can be selected simply. Single phase 415V welders; There have been some instances where a customer thought he had a 3 phase welder (as it was fitted with a 3 phase plug), but in actual fact it was a single phase 415V welder, which was connected across two phases only. This needs to be confirmed before connecting the welder to the converter. If it is in fact a single phase welder, the input current requirements need to be determined and you must then confirm with our factory before proceeding. Welders by their nature are high current / high power devices and while the current draw on 3 phases can be quite high, it is significantly higher if the welder needs to operate of two wires only, in the case of a single phase 415V connection. While we do not recommend the connection of single phase welders to Phase-Changer converters, connection may be possible provided the input power requirements do not exceed the rated output of the internal transformer or of the internal start and load contactors. Connection MUST only be between L1 / red phase and L3 / blue phase. Any connection to L2 / White phase will not work and will probably cause damage to the converter, which will not be covered under warranty. Damage due to component overload caused by the connection of single phase welders to Phase-Changer converters will also not be covered under the factory warranty. In most cases air compressors work fine on a Phase-Changer even though starting loads can be one of the worst possible. Provided there is enough energy available from the single phase supply line to cater for the very high start up currents often experienced, the application will work. However there certainly are instances where this is not the case and the compressor will fail to start typically on the second start. Generally the air tank is empty on initial start and the compressor starts ok, however the second start occurs when the tanks is still under high pressure which results in high compression and extremely high mechanical starting loads. Some compressor manufactures cater well for this and have relief valves to remove all head pressure for start up, but sometimes this is completely inadequate. When the relieve valve is part of the one-way valve feeding the tank, head pressure in the collection pipe is vented to atmosphere at shut down, however this pipe volume is usually very small and is repressurised within a few piston strokes on start up - often before the motor has got up to speed. To overcome this start-up issue, Phase Change Converters offer a head pressure bypass kit comrising a 1/2” solenoid, T fittings, and custom made 415V timer. Simply connect the timer supply cable to the L1 and L3 phases of the Phase Changer, and the valve will vent to atmosphere at shutdown and for the first 8 seconds of starting. This reduced starting issues enormously and allows larger 3 phase compressors to operate on second rate single phase supplies. Click here to go to our accessories page for more info. A successful converter start will be evident by the sound of the rotating pilot motor and the click of the load contactor energising a few seconds later. To start, simply turn power on at the fitted supply circuit breaker or on another separate external power switch that has been installed by your electrician. All Phase-Changers are fitted with a delayed start contactor also. This contactor is controlled by the microprocessor controller and ensures that the pilot motor has stopped rotating before allowing the converter to start or restart. During a normal start there will be a few seconds delay once power is applied before the converter actually starts. In the event of a brown out or other short term power loss, the converter will shut down completely and wait until the start conditions are safe before automatically restarting the converter. All Phase-Changers are fitted with a delayed output contactor that connects the load to the converter several seconds after the converter has started. This prevents failed starts due to loads being connected to the machine at the same time that the converter is attempting to start. This is also for applications like compressors, with the internal load contactor replacing the need for an external timer and motor contactor which is usually required with other converter manufacturers installations. There is also an additional thermal overload protection device fitted inside the Phase-Changer, which will shut down the converter if it is running in overload conditions for extended periods. Phase-Changer Converters are designed for long life operation. Other than an electric motor, there are no moving parts in your Phase-Changer Converter. Regular servicing is not required, other than a semi regular clean by compressed air if in dirty or dusty conditions. One year 'back to base' from supply date. Includes parts and labour, but excludes transport charges. For converters in commutable distance, on site visits may be aranged. See the Operation Manual for full details. The controller is installed inside the power converter and does not need to be viewed for normal operation. The electronics in the converter will detect the motor if it is still spinning, wait for it to slow down to a near stop, add a four second delay, then go through a normal startup sequence. While the motor is waiting to start the 'decimal point' on the LED display will flash. (Note that the single-stage 'PCS' series of converters do not come with this LED display). When the converter starts there is usually a brief 'shudder' as the internal motor is quickly brought up to maximum speed. The LED display will briefly flash a digit '8' as the internal motor is first activated, but this will quickly revert to a '0' or '1' as the converter reaches full speed. Once the 3 phase customer load is successfully applied to the converter, the electronics will measure the load current and decide how it should be managed. As well as displaying a '0' for a no-load condition, the converter can display a value from '1' to '7' which indicates the present drive level of the converter. If the load is a light one, it may simply step up to a level '2' or '3'. Level '7' would be regarded as a heavy load. When the load has settled down, the display will remain steady on a given drive level and the decimal point of the display will have a steady glow. This indicates that all the output voltages are satisfactorily balanced and stable.Display Level '8' is a special 'Hard Start' level that only comes on briefly when the converter is first activated or when a very heavy, hard to start load is first applied. It engages a large bank of capacitors inside the converter to get big motors turning. Equipment such as air compressors and refrigeration systems need a lot of energy to get the motor going against built up air or coolant pressures. The converter will automatically govern the duration of this boost level so that it quickly reverts back to level 1-7 tracking as soon as the load gets going.This special Hard Start level is a valuable feature of all Phase Changer converters. Because it can draw on the energy stored in the capacitor bank and the kinetic energy obtained from the spinning converter motor, it can deliver instantaneous current many times the maximum level available from the power line source. Please understand that a Phase Changer Converter cannot make more energy than what is available on the single phase supply lines and that the success of any installation is reliant on enough enegy being available.